In 1974, Swiss Diamond International Sarl was founded in Sierre, Switzerland, nestled within the gorgeous Swiss Alps. Since its start, the company has specialized in the research and development of new coating technologies for cookware, warehouse machines, and aircraft. Swiss Diamond’s big break came at the turn of the century. In 2000, Swiss Diamond developed a nano-composite coating for kitchen cookware. It used non-stick nano-components along with genuine diamond crystals to make the surface hard, durable, and slick. The concept won a gold medal at the Inventor’s Fair in Geneva. This same award-winning, non-stick diamond technology is what Swiss Diamond uses in their high-end cookware today. Swiss Diamond Non-Stick Coating: Is It Safe? 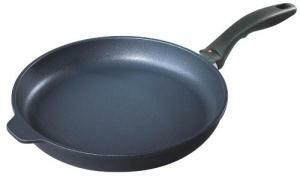 Swiss Diamond uses a patented form of PTFE (or polytetrafluoroethylene) in their non-stick coating. PTFE is what we think of as Teflon, although the real Teflon is a DuPont patent and is not used by Swiss Diamond. Instead, Swiss Diamond breaks down the non-stick particles and reinforces them with the diamond crystals. This process means much less PTFE is required. Recent studies have made consumers question the safety of PTFE non-stick products. One of the chemical compounds in PTFE is called POFA (or perflurooctanoic acid). It is a carcinogenic compound and may contribute to many different kinds of cancer. However, Swiss Diamond assures consumers that all traces of POFA have been eliminated from their non-stick products — a claim certified by the Danish Technological Institute. The products are manufactured at such high temperatures that any minuscule traces of POFA are eliminated in the process. The most well-known product is a Swiss Diamond skillet — but the company’s patented non-stick surface isn’t limited to just skillets. Swiss Diamond also makes saucepans, woks, saute pans, griddles, stockpots, and even full cookware sets. Each is made from cast aluminum. Some are even specially designed for induction cooking appliances. In the fall of 2010, Swiss Diamond developed their product line even further with the Swiss Diamond HD collection. This industrial cookware is made from stainless steel and is aimed at the restaurant/hotel market. The company advertises strong, riveted handles as well as an “upgraded” non-stick coating. To me, this Swiss Diamond Wok is a stand-out product for two reasons: the cooking surface and the added features. Both are things that don't normally come with every wok purchase. Time to take a closer look. In the 1980s, one of the many technological advancements in kitchen cookware was the invention of a titanium ceramic non-stick cooking surface. Companies used titanium to make the surface more durable, allowing cooks to use metal utensils without fear of chipping or cracking the surface.